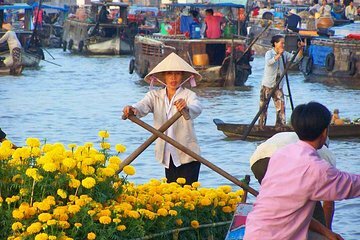 Fuggi dal trambusto di Ho Chi Minh City in favore del tranquillo Delta del Mekong in un tour di 2 giorni che offre una grande introduzione per i visitatori alle prime armi. Una guida si prende cura delle attività di pianificazione, alloggio e trasferimenti in modo da non dover e fornisce una prospettiva interna nella cultura del Vietnam del sud. Esplorerai il mercato galleggiante di Cai Raing, il più grande della regione, e goditi la comodità del pick-up e del trasferimento a Ho Chi Minh City. We had a group of 4 and were able to do so much in 2 days. We went on the Mekong Delta, visited an island where we tasted some great tropical fruits and visited a bee sanctuary. After that we went to Ben Tre for lunch, where we also got to see a coconut making factory. We ended our day in Can Tho and our tour guide Vu took us out for some vietnamese hot pot and grilled beef. Although this was not included in the tour, Vu was friendly enough to take us around the city at night to explore the market and the bridge. The next day we went to the floating market and got to see where they make Hu Tieu noodles, which is a rice and tapioca mixed noodle. After that we stopped for some lunch (not included in the tour) and went back to Saigon. We highly suggest this for anyone who will be going to Southern Vietnam.